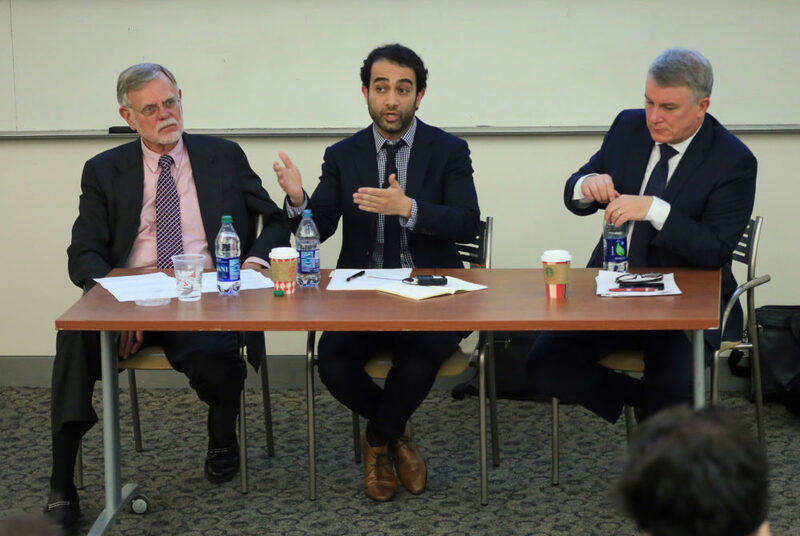 Shadi Hamid (middle), a Brookings Institute fellow and contributing editor at The Atlantic, speaks on a panel about how the United States should handle its relationship with Saudi Arabia. Michael Doran (right), a Hudson Institute fellow, also spoke on the panel hosted by the Alexander Hamilton Society Monday night. Two experts on foreign policy in the Middle East clashed over how the United States should handle its relationship with Saudi Arabia in a debate Monday. At the debate, hosted by the Alexander Hamilton Society, Shadi Hamid, a Brookings Institute fellow and contributing editor at The Atlantic, argued that the United States should reassess its alliance with the Saudi government since the killing of Washington Post columnist Jamal Khashoggi at the orders of the Saudi crown prince. Michael Doran, a Hudson Institute fellow, maintained that the country should preserve its combined effort with Saudi Arabia to minimize the spread of Iranian and Russian influence. Henry Nau, a professor of international affairs and political science, moderated the debate, which took place at the Elliott School of International Affairs. Hamid said the murder of Khashoggi two months ago in Turkey, which U.S. intelligence has linked to Saudi Crown Prince Mohammed bin Salman, was “shocking in its brazenness” and the latest example of “MBS’ recklessness and bad judgment.” He said bin Salman could be a liability to the United States’ image if the superpower continues to ally itself with Saudi Arabia. Doran said while Khashoggi’s killing was “ugly,” other countries like Iran and China had committed equally heinous acts of kidnapping. He added that the incident should not damage the joint Saudi-American effort to counter Iran’s growing influence in the Middle East. Saudi Arabia’s intervention on behalf of the Yemeni government in the country’s yearslong civil war was heavily debated during the event. Hamid said the United States must convince bin Salman to de-escalate Saudi Arabia’s involvement in the war – which he said has caused mass famine throughout the country – by halting its arms sales to the kingdom and threatening to withhold the material support for the war effort. “We, as Americans, because we’re helping the Saudis wage this war, are complicit in a humanitarian and moral catastrophe,” he said. Doran said Middle Eastern countries with a grudge against Saudi Arabia, like Turkey and Qatar, were waging “information operations” against the kingdom in the United States to disrupt the U.S.-Saudi Arabian alliance. Hamid said Doran’s decision to criticize Turkey and Qatar, also American allies, represented a bias in favor of Saudi Arabia. He said Doran criticized the countries selectively to suggest that the United States should not alter its alliance with Saudi Arabia but should push its allies to interact differently with the kingdom. “You don’t think we should use our leverage with Saudi Arabia, you don’t think we can change their behavior, but you do think we can change the behavior of our other allies?” Hamid said.